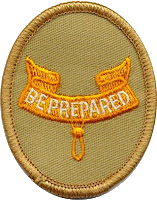 Earn a total of 21 merit badges (10 more than required for the Life rank), including these 13 merit badges: (a) [[First Aid], (b) Citizenship in the Community, (c) Citizenship in the Nation, (d) Citizenship in the World, (e) Communication, (f) Cooking, (g) Personal Fitness, (h) Emergency Preparedness OR Lifesaving, (i) Environmental Science OR Sustainability, (j) Personal Management, (k) Swimming OR Hiking ORCycling, (l) Camping, and (m) Family Life. 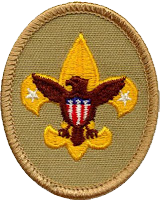 Boy Scout troop. 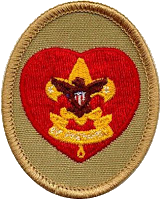 Patrol leader, assistant senior patrol leader, senior patrol leader, troop guide, Order of the Arrow troop representative, den chief, scribe, librarian, historian, quartermaster, junior assistant Scoutmaster, chaplain aide, instructor, webmaster, or outdoor ethics guide. Varsity Scout team. 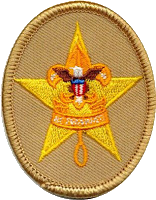 Captain, cocaptain, program manager, squad leader, team secretary, Order of the Arrow team representative, librarian, historian, quartermaster, chaplain aide, instructor, den chief, webmaster, or outdoor ethics guide. 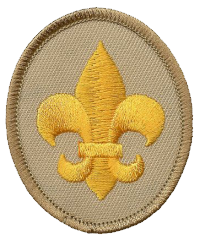 Venturing crew/Sea Scout ship. President, vice president, secretary, treasurer, den chief, quartermaster, historian, guide, boatswain, boatswain’s mate, yeoman, purser, storekeeper, or webmaster. 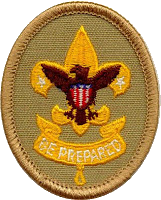 Found in the 1978 printing of the Scoutmaster’s Handbook. 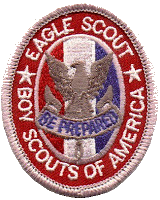 Great ceremony to use when giving the Eagle Charge to your Scouts.